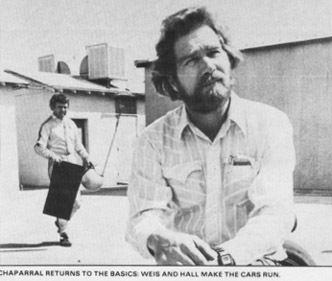 The Chaparral Files contains loads of fascinating pictures from many sources. Here you'll find a selection from the archive. It will be refreshed and supplemented regularly, so repeat visits will pay off for Chaparral enthusiasts. We trust the rightful claimants will support the idea. 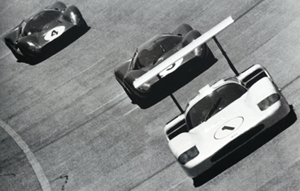 The Chaparral Files have no commercial goals to achieve! If the source is known, it'll be mentioned. 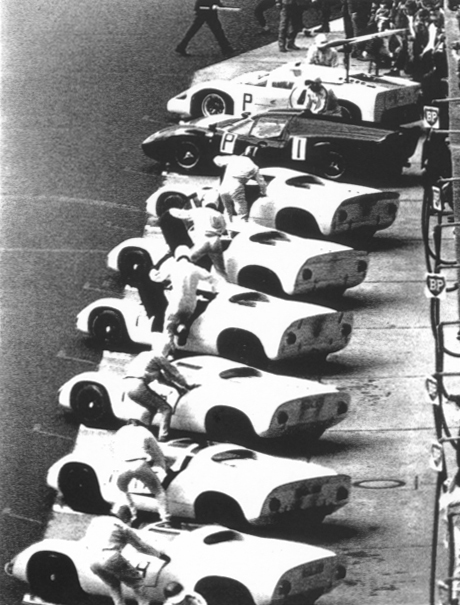 Recently somebody asked by mail if The Chaparral Files know about the existence of a picture of the 2F at the banking of Monza. The answer is yes there is one. 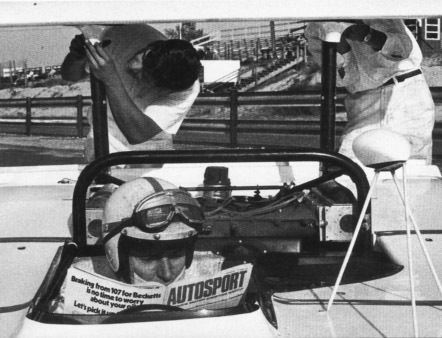 It is taken from the book of Dave Friedman: Chaparral, CanAm and Prototype Race Cars. Unfortunately the reply didn't work. So this is the solution for the moment. Hopefully that 'somebody' will try again by mail. Motor Racing, December 1962. What a peculiar transporter car! The caption reads: "A new line in transporters! Rodger Ward carried his new Chaparral sports car on the back of this impressive Mercedes 'tug' until the car was wrecked at Riverside and Ward was transported to hospital." 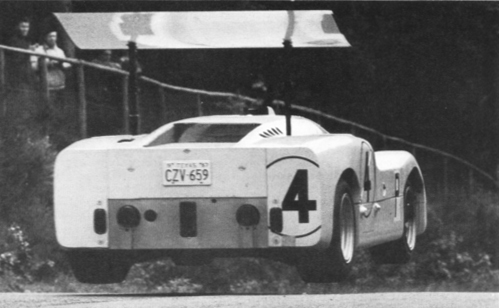 One of the Chaparral made discs broke and chopped through the steering arm, wrecking the car and putting Ward in hospital for a three-month stay with compression fractures of three vertebrae. 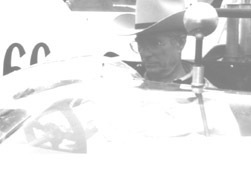 Roger Ward had already won the Indy 500 that year and in 1959. This is Chaparral 1 chassis #004. Initially it was written off. Some mechanical parts survived. Later Troutman made a brand new body and chassis for the car. In May 1992 this recreation car appeared for sale for 350.000 Dollars (source: Falconer & Nye). I wonder what happened to the tug..
Well, some time ago I got a mail from a Chaparral Files visitor (thanks Doug) and he wrote about this tug being ended up in a workshop of Hot Rodder Dean Moon. I googled this name and found this website: www.nitrogeezers.com (sadly not online anymore, Sept 2016) The website shows a picture and says this tug was made from El Camino parts, powered by a Chevy V8. So it wasn't a Mercedes at all. Doug also mentioned the car was mangled in a Southern Californian earthquake but I didn't find more information so far about this fact. Another visitor (thanks Joe) recalls he remembered a magazine in the early Sixties, featuring this car. He thought the car to be a mixture of a Corvair pick-up truck cab and powered by a Chevy located under the bed. But maybe the Dean Moon website is more accurate. 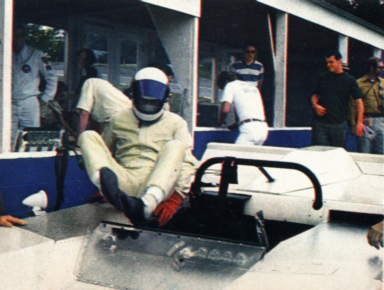 Anyhow, a little Chaparral related secret solved again! Here are two other, more recent links with stories about this transporter: www.barnfinds.com/cheetah-transporter-chase and Automotiveviews.wordpress.com/tag/holtkamp-transporter.